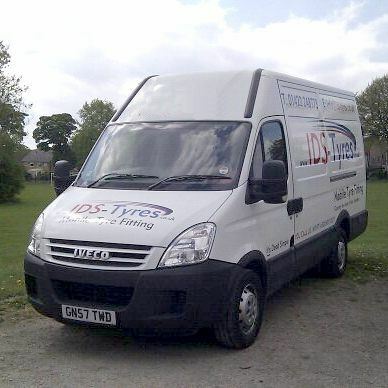 IDS Tyres. We fit tyres where it is convenient for you. It's Dead Simple: you call us… we fit around you! We can repair, supply and fit the tyres you want where it is convenient for you. We're often fitting tyres when people call, so please leave a message and we'll call you back. Why are we the Best Choice for your Tyre Services? We can offer impartial advice about which tyres are the best for your needs. We repair punctures, swap tyres over and we offer advice as well as supplying and fitting new tyres. All Tyre Brands available from 12″ to 22″ including runflats, Winter tyres, van tyres and off-road tyres. We don't have to choose from a limited stock! With direct access to wholesale supplies, we can offer the widest range of brands and models at all price points. The tyres we supply are fresh stock, not ones that have been in storage for much of their design life. With no expensive workshop or admin to pay for, we can offer real value for money at the same time as offering a better, more convenient service. Prompt, personal direct service: no faceless corporation involved. Fitted at your home or your work – we come to you at the time and place that suits. You don't need to drive to a workshop and wait until it is your turn to be dealt with. The price we quote is the price you pay, with no hidden extras. Prices include VAT. Our price includes guaranteed scratch-free fitting, new valves, digital wheel balancing (hidden weights option) and safe disposal of your old tyres. * You do have to fill in all the boxes, including the number question.